I purchased this top one day last week on a sale at Pac Sun after working all afternoon, sometimes working in the mall is not exactly the best thing for my wallet. Ha. Anyways, usually neon yellow is a little bit too wild for me but I love the buttons going up the front, the collar and the lace details. This top is so perfect for a hot, humid day on the boardwalk and that's exactly where I wore it to. These shoes were not exactly the best walking choice but I do love the perfect amount of edginess they bring. This hat ended up being the perfect shelter when we got caught in the rain, fedoras are definitely my favorite hat of choice for summer. Also, wearing this outfit gave me a taste of Philly fashion again. As much as I have loved being home in the sweet country side I can't wait to play up edgy outfits and be in a more fashion filled place again. that colour is amazing, especially with your blonde hair and complexion. love the shoes too! awwww super cute of you! and that shirt looks sooooo retro! EPIC outfit. I would l-o-v-e a shirt like that in neon pink or blue! I love neon for summer! You are so cute! i love ur outfits! u have a lovely site. let's be friends! You look perfect with the neon top :) !! You wear that shirt really well, I love the shoes! Love your neon top! Simply chic! Super cute look! I love the neon lace!! Hope you are doing well, hun! I'm not usually a fan of neons...but you look great in this top! 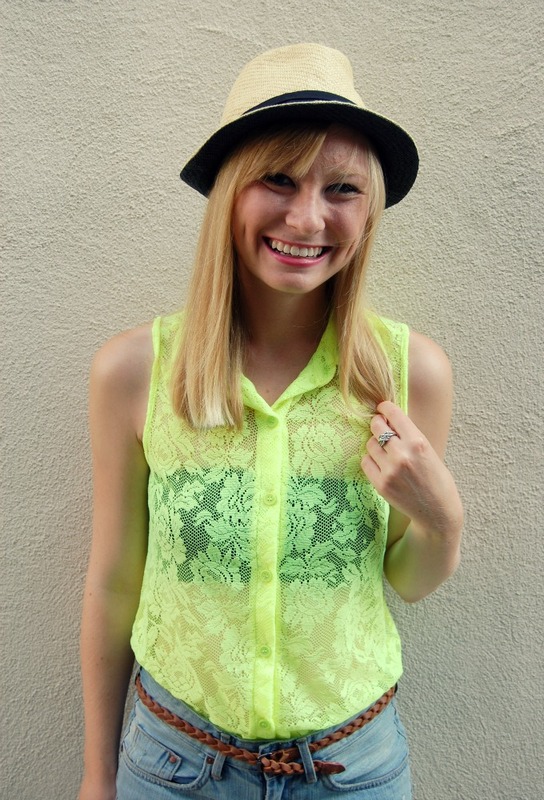 I love how many juxtapositions are going on, the neon/lace against the denim/straw...makes for a really fun outfit! also, thank you for the lovely comment on my DIY tank. I hope you get to try it soon ! have a happy wednesday! Whoa that's bright! I could never pull that off, but you look absolutely stunning in it. The fedora is the perfect touch to complete the outfit. Way to go! Super cute outfit:) I love the neons this season but have yet to venture out. This outfit is FAB! Nice blog! If you'd like, visit my blog and maybe we can follow each other.